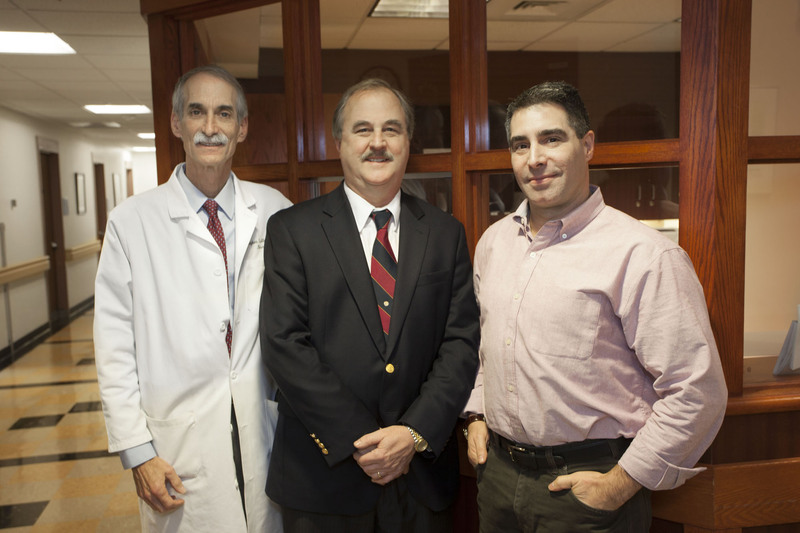 Research spanning the academic-medical partnership among Brown University, Rhode Island Hospital and Butler Hospital is advancing the possibility that the retinas will give doctors a way to identify Alzheimer’s disease risk long before symptoms begin. PROVIDENCE, R.I. [Brown University] —Mark Wolff wanted to know. To him, the thought of suffering through Alzheimer’s disease the way his father did — without knowing, and without his family knowing, what he was up against until late in its progression— is worse than learning, even while he’s still perfectly healthy, that a possible precursor of the disease has gained a toehold. So Wolff, a lighting company executive from Bristol, R.I., enrolled in a trial at Butler Hospital and found out through a positron emission tomography (PET) scan of his brain that he has early signs of amyloid plaque. The presence of plaque, a tangle of proteins that could eventually cause the neurodegeneration of Alzheimer’s disease, is a risk factor — even so, Wolff might never develop the disease. Or if he does, it might not affect him for a decade or more. The trial, being conducted at both Butler and Rhode Island Hospital, is led by Dr. Stephen Salloway, a professor of neurology at Brown University and director of Butler’s Memory and Aging Program. It has two goals. One is to test whether the drug solanezumab will prevent or delay memory loss and slow amyloid plaque buildup in people at increased risk for Alzheimer’s. The other, via a sub-study launched at Butler Hospital, is to test whether a retinal scan can monitor that progress as well as the much more expensive PET scans. Salloway is working on the larger trial with Dr. Brian Ott, a Brown professor of neurology and director of the Alzheimer’s Disease and Memory Disorders Center at Rhode Island Hospital. Drs. Stephen Salloway, Brian Ott and Peter Snyder work together to find new ways to diagnose, prevent and treat Alzheimer's disease. As part of the research, Wolff returned to Butler on a warm summer afternoon for what unfolded like an eye doctor’s appointment. Nurse practitioner Brittany Dawson dilated Wolff’s eyes with drops. From there, he stared into the same optical coherence tomography (OCT) scanner that an ophthalmologist or optometrist would use to look for macular degeneration or glaucoma. For about 20 minutes, while postdoctoral researcher Dr. Jessica Alber operated the machine and guided him through the experiment, Wolff posed his retinas for multiple close-ups that will be independently inspected for the presence of amyloid plaques. Inspired in large part by research led by colleague Dr. Peter Snyder, a professor of neurology and ophthalmology at Brown and senior vice president and chief research officer at Lifespan, Salloway and Ott believe that the retina may provide a reliable reflection of early but significant Alzheimer’s disease risk in the brain. If so, that could vastly expand the number of people around the world who receive an early risk assessment and could save tremendous amounts of money compared to $5,000 PET scans, Snyder said. The best chance for treating Alzheimer’s, Snyder said, will be to identify and treat the disease long before symptoms arise, because by then too much damage may be done. Meanwhile, the need is so widespread that it must be done inexpensively and with non-invasive equipment as common as an OCT eye scanner. PET is both too costly and not widely available enough to be the first-line screening tool. Snyder expects that doctors will need to combine several biomarkers to produce an estimate of patients’ eventual Alzheimer’s risk: family history, genetics, and cognitive and memory tests will likely combine with multiple retinal indicators into a comprehensive algorithm. Those with especially high emerging risk might then go on to PET scans and early-stage treatments — perhaps solanezumab — as those are proven, he said. The retina is a part of the central nervous system that doctors can see by opening nothing more than an eyelid. The retina has the same biochemistry and similar organization and cell types as the brain, Snyder said, so it makes sense that it, too, would be similarly susceptible to amyloid plaques. It’s no surprise given that the retina forms out of the same tissue as the brain in just the first few weeks of an embryo’s development. "Inclusion bodies" of amyloid plaque are visible in a subject's retina in this scan published in Dr. Peter Snyder's 2016 paper. In recent years, scientists have noticed that amyloid plaques built up in the retinas. In 2016 in the journal Alzheimer’s and Dementia, Snyder and co-authors published a study of 63 cognitively normal adults with at least one parent with Alzheimer’s (just like Wolff) that compared the results of OCT scans with PET scans in the same patients. Snyder’s team found a significant relationship between amyloid levels in the cortex of the brain, as measured by PET, and the total surface area of what appear to be amyloid plaques visible in the retina. “Our findings support the hypothesis that retinal biomarkers could be a useful screening tool to distinguish individuals at risk for developing Alzheimer’s disease, and could be helpful in identifying ideal candidates for secondary prevention trials,” he and his co-authors wrote. That hypothesis is now being tested further in Salloway’s sub-study. 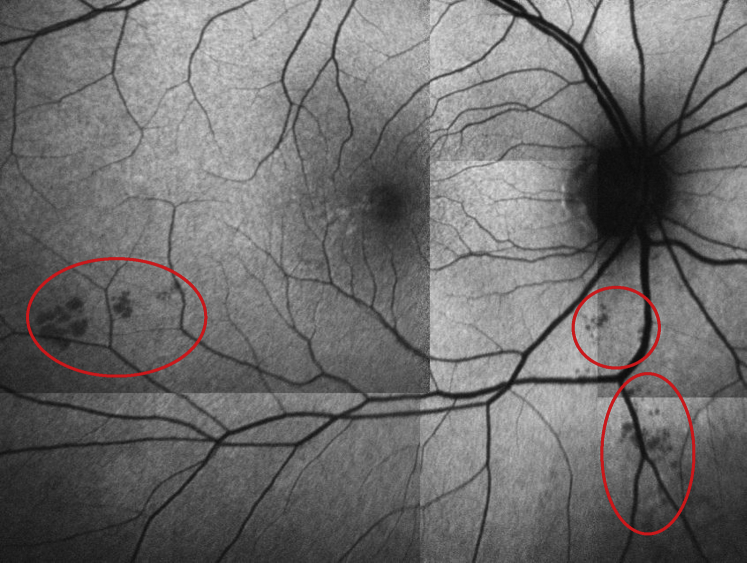 In other recent work, Snyder’s research group led by Alber showed that retinal scans can also indicate other potential precursors of closely related neurodegenerative disorders, such as cerebral amyloid angiopathy. The group is also studying how OCT can image changes in the vasculature of the retina, because amyloid can attack and alter blood vessels as well as neurons. Finally, the researchers are measuring associations between the presence of amyloid plaque and the thickness of individual layers of the retina. In a recent presentation in London of a small study, the team reported that the retinal nerve fiber layer thins as amyloid plaque in the brain increases. As sensitive as conventional OCT has proven to be in measuring the retina, Snyder said, it could get even better through the work of Jonghwan Lee, an assistant professor of engineering at Brown. In his work to improve neural imaging, Lee has developed sophisticated algorithms that amplify the signal of OCT and reduce the noise. These improvements have allowed him to produce stunningly high-resolution imaging of blood flow — red blood cell by red blood cell — in even the tiniest capillaries of neural tissue. That means he might be able to very precisely observe some of the small but early changes in vasculature that Snyder is interested in. The two have begun to collaborate. Working in a mouse model of Alzheimer’s and with healthy controls, Lee hopes to track down the earliest vascular, neural and behavioral changes associated with the disease as the mice age. 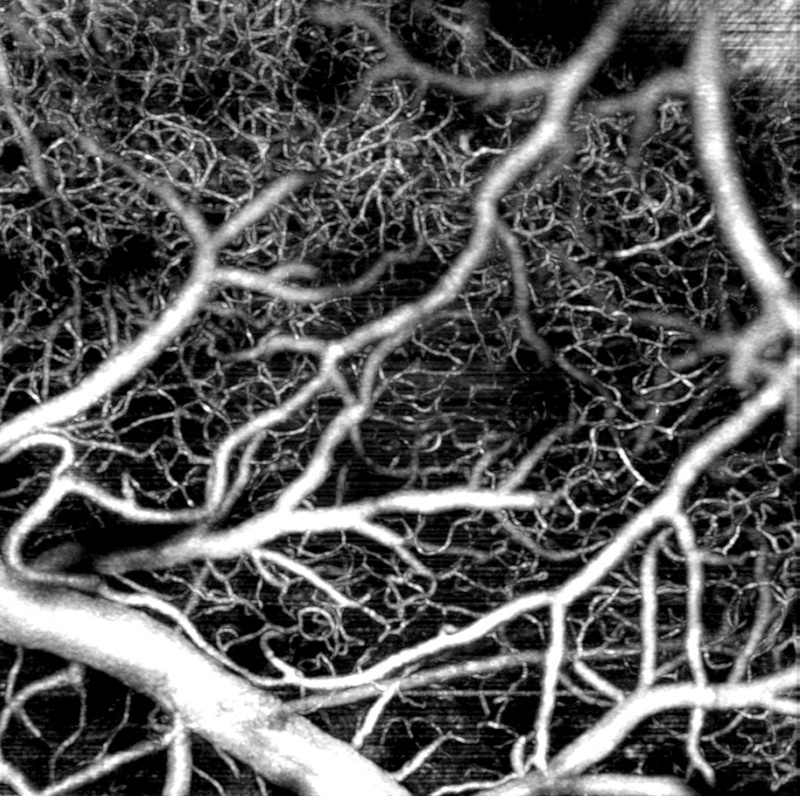 In stunning detail Brown engineer Jonghwan Lee can use retinal scanning technology to image the vasculature of neural tissue. “So we will make a bigger picture of which one is first, which one is earlier and how much it is earlier and significant,” Lee said. The goal would be to compile a predictive algorithm of the disease’s progression in the mouse from its very earliest stage using a similar combination of biomarkers — physiology, cognition and genetics — that Snyder suspects will need to be compiled for people. In the exam room at Butler, Betty Wolff, Mark’s wife of 45 years, shared that it was initially hard for her to hear the results of the PET scan, but she agreed that it’s better to know. If the infusions he’ll begin later in the summer contain solanuzemab rather than the placebo and if the medication works, his enrollment in the trial might help to stop or slow the disease even before it even gets started. And at least if Wolff becomes symptomatic with Alzheimer’s down the road, the family will have had ample warning and will be able to manage the condition as well as possible, right from the start. None of those possibilities was available for Wolff’s dad, which is why he’s so eager to volunteer to advance this research. He’s no stranger to volunteering, having been a blood donor and a Big Brother for decades. Volunteering for research is a way to help society get the upper hand on Alzheimer’s disease, he said, and the huge suffering and costs that it brings.